With our modern conveniences, we are almost unknowingly conditioned to expect immediate and effective responses from everything. When a child misbehaves, many look for an appropriate discipline, but if it doesn't prove effective immediately, then it's considered a failure. Trying a diet is often just that and nothing more. When something goes haywire after the first week or two, it falls by the wayside. While the trouble is obviously lacking patience, it is also common to simply look at symptoms and not consider a root cause of a problem. Why is the child misbehaving? Why does every diet only last a couple of weeks? We could be talking about anything from educational issues to budget problems to relationship complaints. If we aren't considering what originally caused this problem or series of events, it is likely to continue to be a problem until we do. 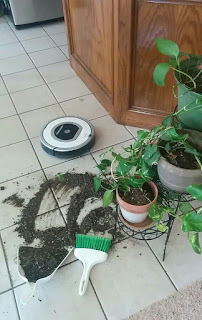 This afternoon I was letting my very convenient Roomba robot vacuum in my kitchen as I straightened up when all of us a sudden I heard an unfamiliar crash. A 3-tiered plant stand with 3 medium sized ivy plants had fallen to the floor because my little robot had gotten hung up on some ivy. Modern conveniences aren't always that convenient in the end. Sometimes we do things in the name of convenience or expedience that just don't really cut it and require us to spend even more time correcting a problem that could be avoided by doing something the long, but often more effective way. Our society has that attitude with a lot of things. Educationally, we expect everyone to learn on the same schedule and have to go to great inconvenient lengths to accommodate those outside the average. It seems to be very typical to treat symptoms with the quickest remedy often not considering the underlying cause or subsequent side effects of treatments. Especially in our marriages, when issues aren't fixed quickly it is common and tempting to just move on. I've only been married (almost) 10 years, but we absolutely wouldn't be together if we had moved on every time things got really really difficult. My brother the orchestra conductor was sharing his opinion on teaching middle school string students. He said some teachers are in a big hurry to get them playing more and more literature at the highest level possible. He said he would much rather students enter high school with a great knowledge of basic skills. The basic skills, in his opinion, are far more important to establish first. It may seem to take a bit of time in the beginning, but in the life of a musician it pays off beautifully being able to play all the literature they desire with artistry and proper technique for many years to come. I come from gardeners and I'm attempting to share that experience with my children. I'm certainly not great at it, but I have learned a few real life lessons. Things take time. There's always a reason something isn't working and ignoring it in some way isn't going to fix it. The end product is more than just the piece of fruit or vegetable you gain. The process teaches us about life, problem-solving, perseverance and an amazing Creator. I'm very passionate about learning and natural health for all of these reasons. In health and in learning, things always take time. When you try to circumvent the natural progression of things, it generally doesn't go well in the long run.